The Backstreet Boys began last week shooting a new music video for their upcoming single in LA and ended it with a visit to London, making a triumphant return to British radio and television. 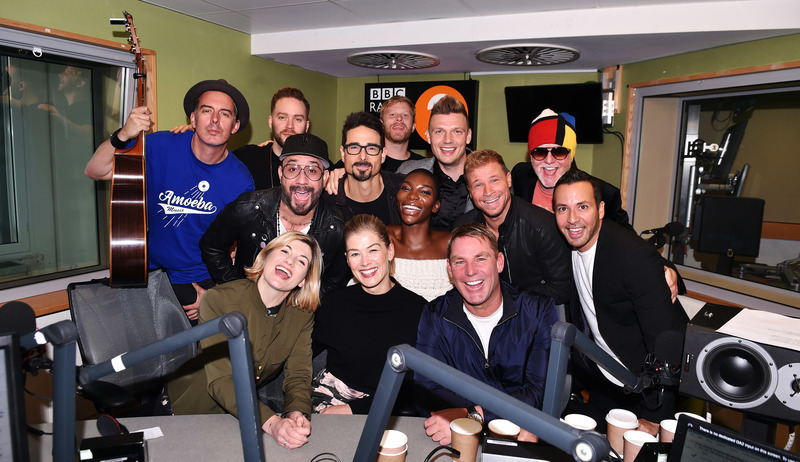 UK fans woke up pretty early Friday morning to catch the Boys joining The Breakfast Show With Chris Evans (along with Doctor Who star Jodie Whittaker, who happens to be a fan) chatting about their former adventures in the area, when fans can expect to hear a few “secrets” released and performing a few hits acoustically. Oh, and there was also the cover of Blackstreet’s “No Diggity” that has the internet abuzz. Watch below! After recording an episode of Loose Women which will be airing at a later date, Kevin, Howie, Brian, AJ and Nick made their debut performance on Strictly Come Dancing with a medley of hits from “I Want It That Way” to “Everybody (Backstreet’s Back)”. Their performance sent them to the top of the trending topics list in the UK, with hundreds of tweets praising their vocals, dance moves and wanting Backstreet back for more. “Backstreet’s still got it,” one Twitter user posted. Even Darren Hayes, mostly known for being one half of super duo Savage Garden, got in on the admiration, tweeting, “My heart. Love these Boys. Always will.” Catch the Strictly performance below. The Boys are prepping for big things to come through the end of the year, but first, they’ll head back to Vegas on October 24th.